That’s the first line of Waiting for Godot, which Patrick Stewart accompanies with a shrug. This combination becomes not just a running theme but a running gag. 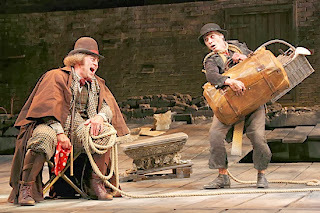 This new production of Waiting for Godot, with its “new” pronunciation (stress on first syllable GOD followed by a clipped long “o”) sounds right, looks right, feels right. In fact, everything about this production directed by Sean Mathias is so right that I’m calling it the be all and end all of Godots. The ruined set of rubble and broken boards, crumbling walls and one lone, bare tree is already more set than Samuel Beckett wrote. Nevertheless, its decrepitude is as magnificent as the decadence of the old Palladium, assuring us that life was once lived here but now not so much. Stephen Brimson Lewis’ design for this set and the utterly natural costumes are perfection. In contrast to their roles in No Man’s Land, Patrick Stewart here is the exuberant one, and Ian McKellen the morose and unusually quiet one. Patrick Stewart entered the stage as Vladimir, a.k.a. DiDi, seemingly delighted to be alive. 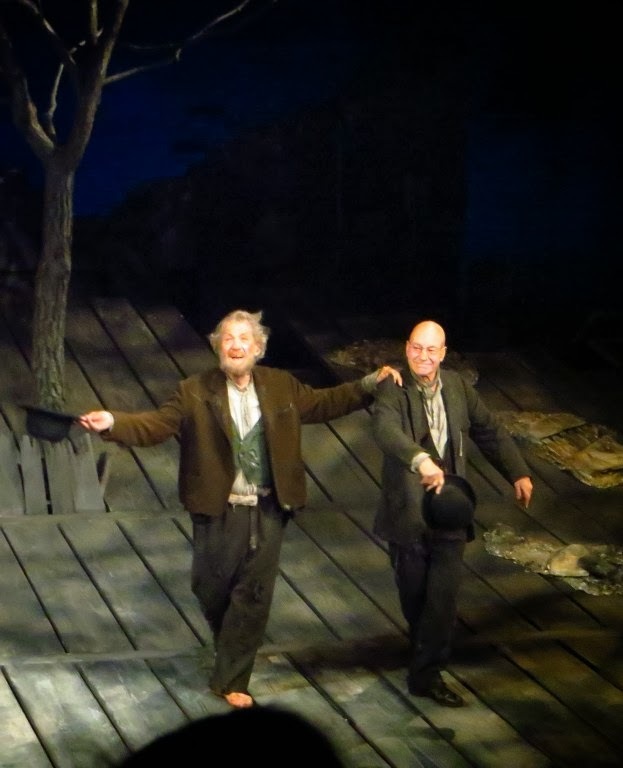 When Sir Ian climbed onto the stage from nowhere to appear as Estragon (GoGo), people in the audience annoyed me beyond measure by applauding just because the actors showed up. It’s their job to show up. Ian McKellen and Patrick Stewart and Shuler Hensley and Billy Crudup all did a good deal more than just their jobs. They found a way to live in that dreadfully confusing, perversely funny world created by Samuel Beckett and made us love — or hate — them for a while. Laughter assuages the pain of that reality. Back to McKellen’s entrance — he climbs onto the stage from a ditch where he was beaten the night before. Not for the first time. DiDi’s insistent cheerfulness is apparently more than GoGo can bear past dusk and he goes off alone after their long wait. Over and over. And back they come, to wait for Godot. Shuler Hensley as Ponzo and Billy Crudup as Lucky. Photo Credit Joan Marcus. One must wonder why anyone continues to force survival in this lifeless world. Yet Act 2 shows a few buds on that bare tree. So is Act I the winter and Act 2 the beginning of spring? Early spring, cold, but budding. GoGo & DiDi survive each day by each other’s company. DiDi talks GoGo out of suicide by hanging in order to keep his company. After all, if one helps the other to achieve such a final goal, the survivor will lack help to join him. Hell, apparently, is not other people as Sartre told us in No Exit. It’s loneliness. Two people, three, four together can survive anything so long as they are not left alone. They can and will come back every evening in hope and belief that the expected Godot will arrive. While their hope is dashed at every dusk, they’ll do it again so long as there is more than one waiting. To break up GoGo & DiDi’s day, Ponzo — interpreted as a good ol’ boy by Shuler Hensley with a southern snarl and frightening clown-like make-up by Tom Watson — does hog calls and leaves all the heavy work to a slavelike creature named Lucky. Lucky, while not a pig despite Ponzo’s repeated calls, is barely identifiably human, as played with fragility by Billy Crudup. His focus and concentration on whatever world Lucky lives in is remarkable to see. These guys were having a fine time. Once or twice a boy comes to see Estragon and Vladimir, professing not to recognize them at all and denying he was there the day before. He tells them that their wait for Godot is over, because Godot is not coming that evening. Surely tomorrow. Estragon, Ponzo, and the boy appear to recall naught of the day before, while Vladimir is cursed with remembering it over and over. Lucky — well, who can tell what Lucky remembers besides a long string of fabulousness. Vladimir reveals to his fellows what has previously occurred, but it’s meaningless to them. Is it Vladimir’s memory that gives him faith? I think we enjoy being mystified by the “meaning” of Waiting for Godot, which is revived quite regularly. I think we long for interpretations that tease us and then allow us to stop thinking about it, interpretations that allow us to trust the director and actors to tell us, obliquely, what they think it’s about. I am happy to entrust the “Meaning” to this company. Some forms of art should creep up on you while you’re not looking. Speaking of Samuel Beckett, we saw another one last week at the 59E59 Theaters – All That Fall. This is one of Beckett’s radio plays, transported to the stage as a play within a play — sort of. There’s no muss, no fuss, no extraneous set. Just a room with old-fashioned microphones hanging from the ceiling, and half a dozen chairs lined up on either side of the stage, facing each other. One set piece will be a car later. This spare set design was by Cherry Truluck, with clear lighting by Phil Hewitt and apt sound by Paul Groothuis. The actors walk in and take their seats while some sound effects come into play. These are the radio actors. This concept was interesting to watch as actors played actors playing characters. Odd, without a doubt, but interesting. It was clear when an actor was the actor playing a character. Sometimes the actors laughed silently when not “onstage” (but seated on the side). The heart of this play is a riveting, sad and hilarious performance by Eileen Atkins as Mrs. Rooney, who is walking to the train station. We see she drags a leg (and hear the radio sound effect), and watch as she meets neighbors on her journey to the station to meet her blind husband played by Michael Gambon. Each of the neighbors with whom she chats, laughs, or disputes along the way has his own cross to bear, and each is vocalized by an actor playing an actor….you get the picture. 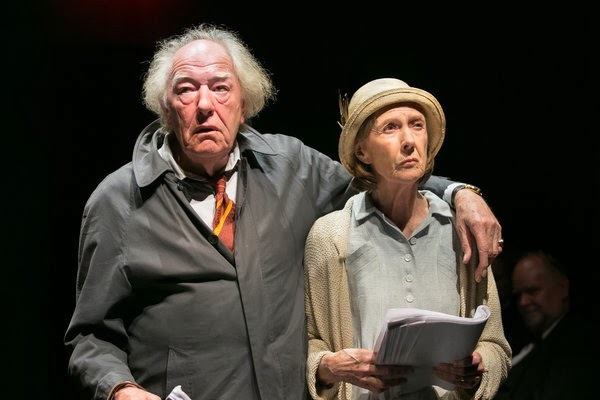 As No Man’s Land is Beckettian Pinter, so All That Fall is rather Pinteresque Beckett, with laughs at the human condition surprised by a devastating burst of sorrow. Director Trevor Nunn kept it clean and simple, and every actor was on the mark. Standouts were Trevor Cooper as Mr. Slocum, Catherine Cusack as Miss Fitt, and Ruairi Conaghan as Christy. Two PInters + Two Becketts = theatre that forces you to think, then forces you to admit it was pointless. Nothing to be done…..
~ Molly Matera, signing off to re-read some Beckett….